Back in June I was fortunate enough to meet the SmoothSkin ladies at the Bloggers Ball, I had first read about the Gold IPL over at LadyWrites and was desperate to try one out. Unwanted body hair has long been the bane of my life, I've dabbled with shaving, waxing and epilating as well as hair removal cream and, experienced a few horror stories along the way (burned my face with wax when removing my moustache and left hair removal cream on for too long in places where you really don't want to leave hair removal cream on for too long). At the Bloggers Ball I was given the opportunity to enter a competition to win my very own SmoothSkin Gold IPL - and I DID! I can't tell you how thrilled I was to have won this little badboy. It arrived in super quick time, especially considering mine was a competition win and not a paid for order. The packaging was immediately impressive consisting of sturdy branded box with a snazzy magnet snapping it shut - the box works perfectly as storage for the IPL allowing me to keep it safe and not get wires tangled up. The handy IPL comes with an adapter and little manual with step-by-step instructions that ensure you can't go wrong. The SmoothSkin IPL uses light energy to break the cycle of hair growth. A revolution in at-home permanent hair removal, the light energy is transferred through the skin's surface and absorbed and converted to heat energy (under the skin) which disables the hair follicle and prevents further growth. IPL works on all but the very darkest of skin tones, as darker skin tones contain more melanin meaning that they require more light energy. The IPL has an in-built detect and set feature that analyses the skin tone of the selected area by lighting up and distributing the correct amount of light energy per surface. Ten lights means that the tone is perfect for use and zero lights or red lights mean that the area is unsuitable and no energy will be released. No, although there is a slight burning sensation it doesn't actually hurt. Also, for sensitive areas there is the Gentle Mode which reduces the energy released - I find this setting more comfortable for my face as my face doesn't like stuff being done to it too much. I have found that I feel the most sensation on my armpits than anywhere else but it's not unbearable. The glide and stamp motions can be used as required. I tend to glide the IPL along my legs and arms whilst continually holding the button but use the stamp method for smaller areas such as bikini line, armpits and face. The most important question - does it work? I shaved my hair before use and didn't really notice any difference however, a difference isn't expected after one use. It took me a while to get into the swing of things, feeling slightly nervous and unsure that I was doing it right it took me double the suggested twenty minutes to cover my whole body. I managed to get into the swing of things much quicker and had covered my whole body in the twenty minutes. I noticed that the regrowth of my hair was slightly slower - especially on my bikini line. I figured that this is where my hair is darker, lighter hairs take longer to remove. I noticed a huge difference in the time it takes for regrowth. It's safe to shave between IPL uses but only shave as tweezing and waxing removes the bulb of the hair. ruining the process. At this point I was at a stage where I was shaving my legs twice a week rather than the every-other-day routine I was previously in. This week marked a month of my IPL usage and by this point I felt like an old pro - I was well in a routine with using it and using it had almost become second nature. I had noticed that my hairy hobbit toes were nearly hair free (just the mammoths on top of my big toes to tackle next). Almost half way into my journey of SmoothSkin freedom and I was at the point where I was (and still am) only shaving my armpits once a week - on a Monday (my IPL day). 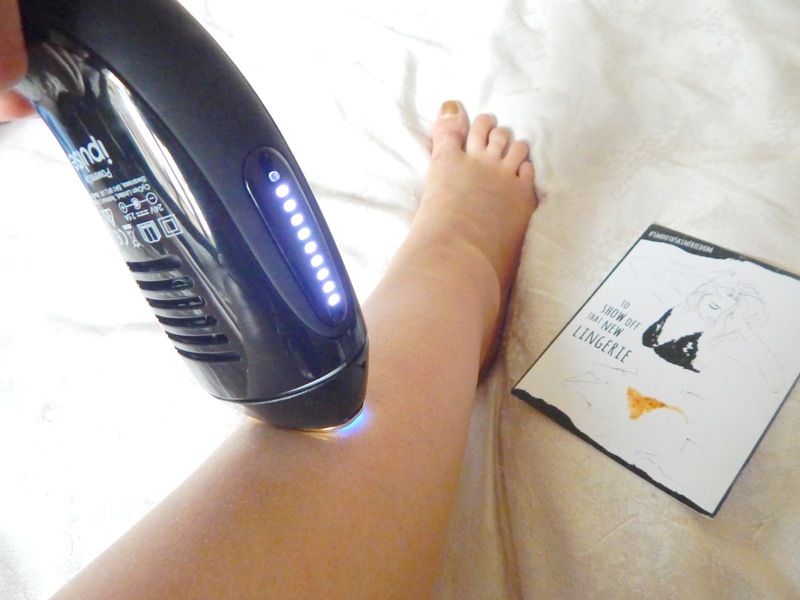 My leg hair re-growth was slower than ever and my bikini line was satisfyingly patchy - proving that the devise does work and that I was a little hit and miss with my stamp method. I'm officially half way through my twelve week journey and am loving the results. I could easily go without shaving my legs at all in between IPL treatments but I can't help it sometimes. This week I'm going to try not to at all to really feel the benefits of the IPL. As a company, I can't fault SmoothSkin for their customer service. 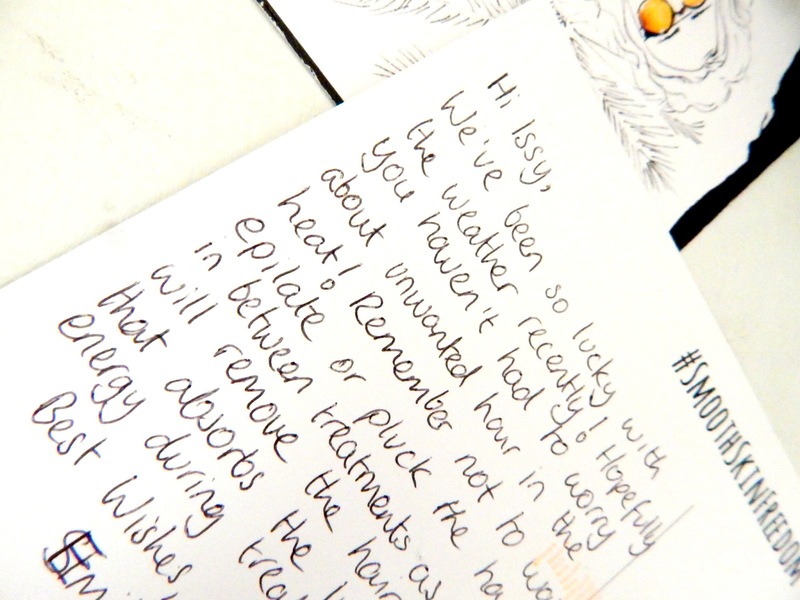 Every week I get a branded postcard from Emily letting me know how far along I am on my journey which is great for keeping track with treatments. Emily also lets me know at what stage I should be in my journey which reassures me that I am doing it properly. Thanks Emily! The IPL doesn't last for ever, the bulb is irreplaceable but before you decide you're never going to buy an IPL bear in mind that the it comes with a certain amount of flashes - mine comes with 200,000 flashes which, following the recommended treatment regime is enough to last for ten years people! You would be paying £269 for ten year's worth of at home hair removal. It's a bargain when you think about it. I'll be posting a 12 week update on here when I will have essentially completed my treatment for now, I'm off to stroke my smooth legs. For more information in SmoothSkin and their products wander over here.